designsbyambershaw: SNEAK PEEK - comment to WIN! Happy Monday Digi-Friends! 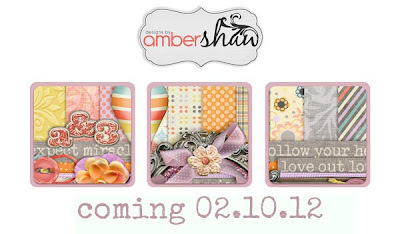 I have a new sneak preview of a kit that will release on 2/10/12. I could NOT stop creating when I got started with this kit so there are LOTS of extras. Clusters, borders, page starters, glitters, paper pack, and a huge patterned style set that is even CU friendly! I can hardly wait to release this to you, but until then leave a comment here now through 2/9/12 - my hubby's birthday :) - and you will be entered to win this kit! Ooo, sounds awesome! Can't wait to see it :) Please count me in to win too! Maybe I can expect a miracle and win, lol (sneak peek window one!). Such soft, pretty colors. I really like the designs on the paper! oh its so wonderfull ! Great choice of color!!! I imagine this kit is wonderful!!! And thanks for the chance to win it!!! It looks amazing, would love to have it! But why does it say "coming 10.10.10"?????? Thank you all for you comments, and Stash Empress I was hoping nobody noticed that until I could fix it later LOL, I just noticed it a little while ago. It actually releases 2-10-12. Looks very nice, Thanks for the chance to win it. New kit is awesome! thanks so much for the chance to win!